Autumn is the most delicious time of year! We’ve been busy in the kitchen cooking up a storm with the gorgeous seasonal squash that are available now. This moist fruity squash cake is made using Harlequin squash and is topped with a delicious orange spiked cream cheese frosting. A perfect autumn bake, ideal for serving at Halloween or Bonfire Night. Squash cake is easy to make and takes very little time – don’t even peel the squash just grate it straight into the batter! I love a robust rustic cake – so much easier to make! The smell of the squash cake whilst cooking is amazing, lovely warm wafts of sweet cinnamon, it’s so autumnal! A moist and utterly delicious autumn squash cake with cream cheese frosting. 150g grated squash - just weigh and grate don't peel it you can eat the peel. Add the sunflower oil and eggs to a large mixing bowl and mix well with a whisk. Tip in the sugar, flour, cinnamon, baking powder and mix with wooden spoon. Add the grated squash and sultanas, mix well. Tip cake batter into the loaf tin and bake for 40 - 50 minutes until a skewer comes out clean. To make the frosting simply add the Philadelphia, double cream and icing sugar to a food processor and whizz until stiff and spreadable. 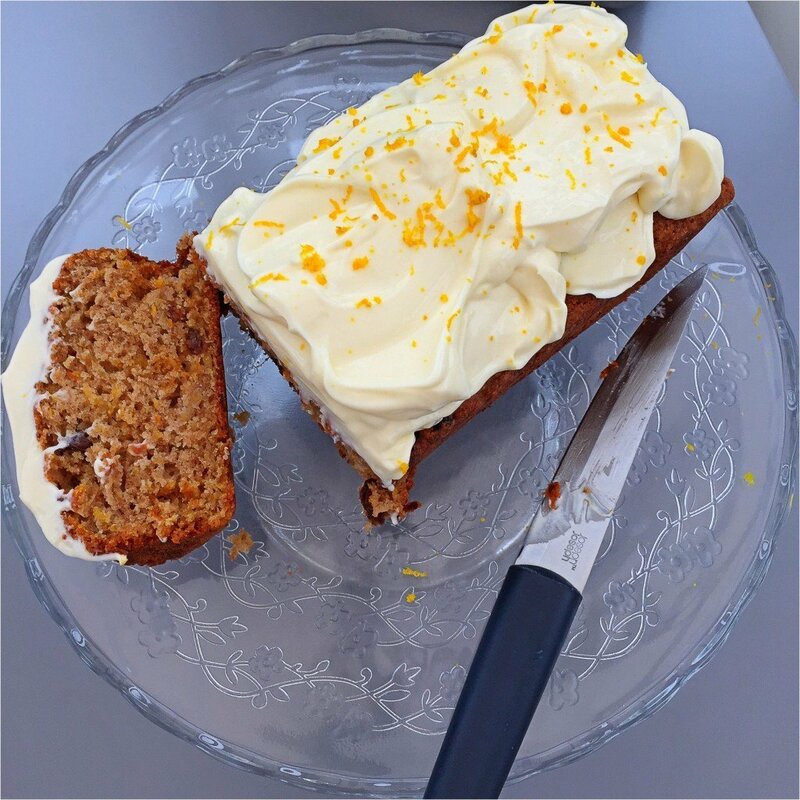 Top the squash cake with the frosting in a rustic way then scatter with orange zest. A perfect cake for an autumn afternoon with a cup of tea.